It took laptop developers years to come up with the current solution: the mouse pad. Originally called a touch pad, the mouse pad allows you to control the mouse by gliding a thumb or finger along a flat surface. Buttons nearby emulate the left and right buttons on your typical bar-of-soap mouse. It helps to use your forefinger to move the mouse. 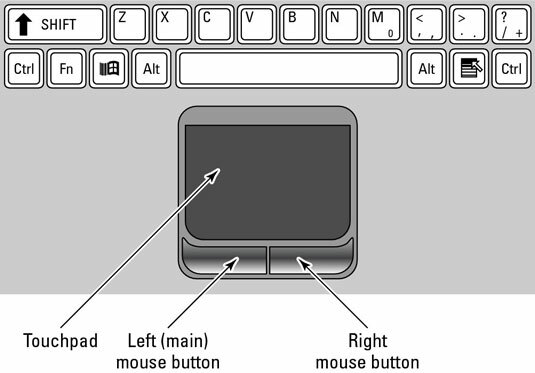 Use your thumb to click the left-right buttons on the bottom of the mouse pad. A light touch is all that’s required. You must be careful not to touch it in more than one spot. If you do, the pointer jumps about on the screen as though it were being electrocuted. Touch the mouse pad in only one spot and with one finger. Try to avoid accidentally hitting the right mouse button when you mean to hit the left one. This causes context menus to pop up in Windows — very frustrating. Some mouse pads let you tap the pad to simulate a mouse click. You can check the Mouse icon in the Control Panel to enable or disable this feature.